One aspect of smart phone photography I need to investigate is their incorporation of Artificial Intelligence to assist users taking a really good shot. I've read that camera manufacturers are having to up their game as the advances in smart phone photography (especially with AI) means that people can take better photographs with them than with a bridge camera. Not sure how true this is, but it should be interesting if these AI algorithms make their way into bridge and thence DSLR cameras. In the meantime, I find the Auto everything both a blessing and a curse. I certainly have lots of fun and games trying to persuade cameras of all flavours to focus on what I want it to focus on. I have tried manual focus, but I don't think I have set the dioptrics up properly; I wear glasses for one, plus daughter and memsahib uses the cameras and reset the dioptrics. I used the cameras as how I reckon 99% of people would use them: hand held, minimum of set up (basically auto), and point-n-shoot. Which is pretty much how I use them. I'm not sure if I mentioned but I used jpegs from the Canon 800d for a fair comparison with the bridge cameras. RAW would have contained even greater detail, with the potential to enhance images even further. Here are some further photos for comparison, simply as in all the years I have used a bridge camera I never understood what the reviewers were going on about. I am still very happy with most of the photos produced by my bridge cameras, but appreciate how much I can push them. 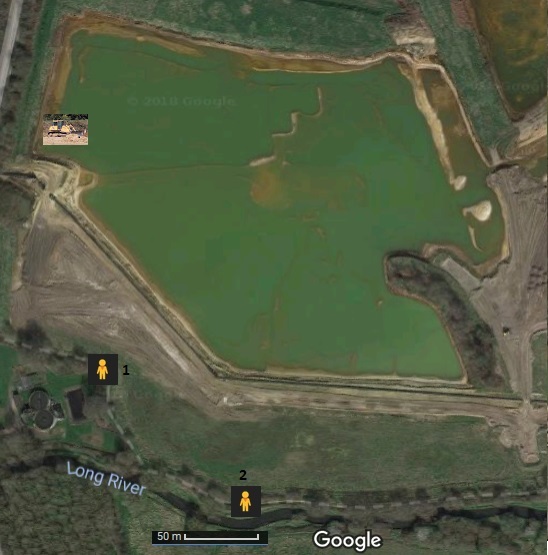 As usual I hand held my cameras (as well as my breath), with the FZ72 on auto and the DSLR on P.
Firstly, here is a google map view of approximately where the birds were in relation to me and the proto-reserve. Note, the water levels in this google earth image are much lower than those in the photos I took yesterday. We begin with the distant swan. The FZ72, maximum zoom of 1321mm equivalent and 1/250 sec exposure. I feel both cameras did very well over what is really a bit of a silly ask range wise. 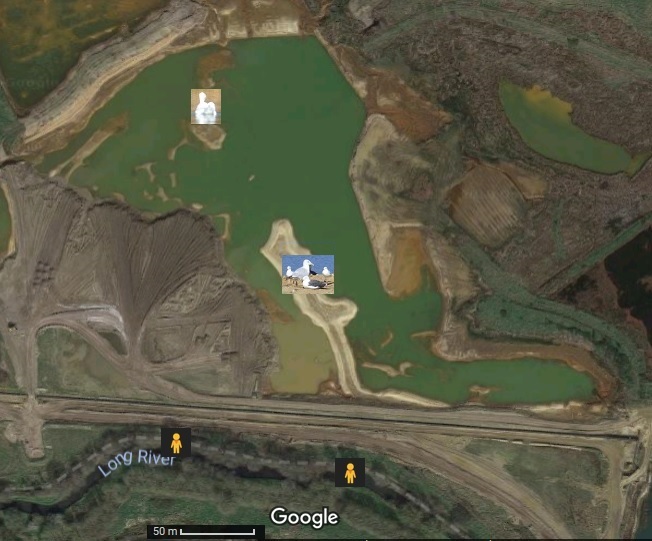 If the scale on the google earth image is to believed then the swan is about 150 yards away. I reckon the DSLR could produce even better images with a really decent lens. But we are talking major amounts of money. Some of the eye watering prices I see, even for the lower end ones, are more than I would pay for a good second hand car or, in some cases, a new car! Once subjects get a little closer then the DSLR begins to pull ahead. This is what the 800d did with the Barnacle geese for comparison with the FZ72 photos I posted earlier. 300mm and 1/395 sec exposure. Now turning to a mechanical subject. The problem is I can't remember where I was standing for these shots: position 1 or position 2. Oh, this is Finch pond. Most of it has been filled in. The bulldozer, placed in water in this image, is well and truly on dry land. FZ72 at 232mm and 1/400 sec exposure. Be careful when looking at these comparison photos. I am not sure if the FZ72 was focused properly on the bulldozer. Cropping out the dozer. Wow! 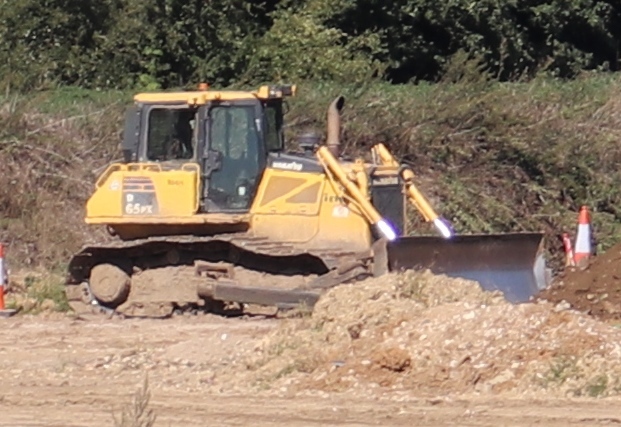 Except the 800d has rather a lot of focus points, and I think it was focused on the dozer. Not sure. Now the pile of spoil. 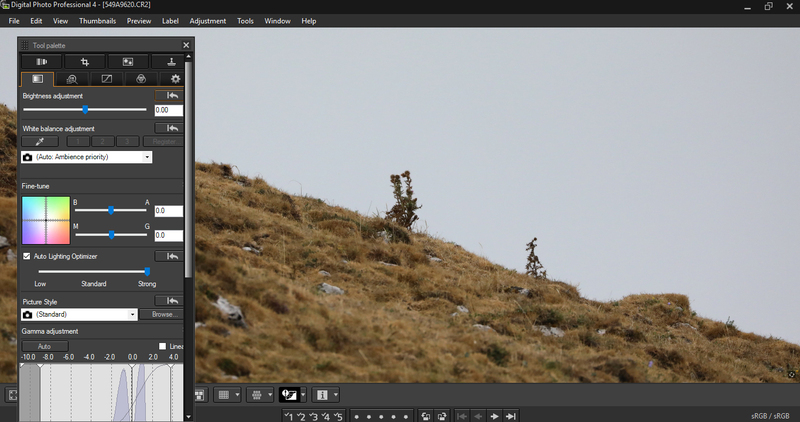 Well now, I reckon it is a close call between the FZ72 and 800d. My main missions was to show that in good light conditions (bordering on perfect) bridge cameras really are rather good (upholding the verdicts of reviewers) and to test, mainly for myself, their claims about cropping DSLR images. I am still a novice with all to do with photography, and will probably never get too deeply into the subject, but continue to get great satisfaction of using both types of cameras. With a little more knowledge I can improve the shots I take, but will reach a point of diminishing return. Thus, my philosophy is not to get too hung up about the technicalities, photograph everything of interest and just have fun. I too am following this thread with interest myself. 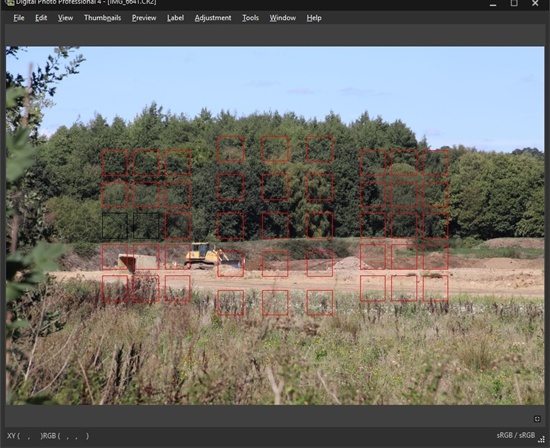 @ Angus, if you want to see were your focus point or points locked on with your Canon 800D open the Dozer picture up in DPP while your curser is on the picture right click go down the menu and click on AF focus points unclick when finished viewing. Blimey! You live and learn! That's what makes it so fun. Thanks, Jim. It's amazing what information is embedded in the CR2 file. Here are the focus points. It's quite fun moving the camera around, ever so slightly, to end up with the focus points you want. I do cycle between the various modes. 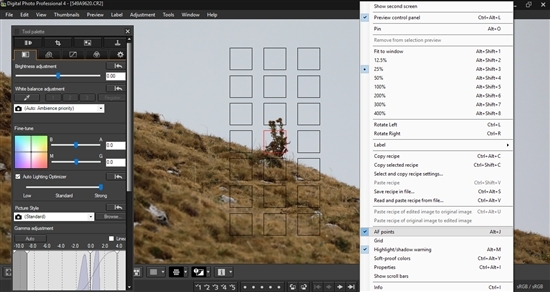 I find centre point is essential for threading the focus between vegetation to target the object. I reckon the DSLR could produce even better images with a really decent lens. But we are talking major amounts of money. Some of the eye watering prices I see, even for the lower end ones, are more than I would pay for a good second hand car or, in some cases, a new car! That's the ONLY rule of photography in truth - enjoy what you're doing! "Don't be afraid to experiment"
Need: The Tamron currently covers the range I require. Wide angle for recording changes to the proto-reserve or scenic shots. 300mm telephoto for wildlife shots. Granted anything above 250mm and the lens struggles. I have toyed with using a bridge camera for scenic shots, and a dedicated telephoto lens (e.g. Sigma/Tamron 150-600) for the wildlife shots. Cost: I still feel uneasy about shelling out £600 or over for a lens; especially as I am so hard on camera equipment. However, funds are allocated for more urgent matters like: getting my youngest through college, replacing our tatty 28 year old kitchen and builders' double glazing, even tattier carpet, etc, etc, etc. Self preservation: If questions 1 and 2 are not addressed before purchasing an expensive toy then I get these visions of the memsahib sawing away certain parts of my anatomy with a blunt rusty blade and a somewhat annoyed glint in her eye. I'll wait and see how the next few months pan out. I will feel on much safer ground if I real need pops up and/or the kitchen/double glazing/ etc are fixed. I'm guilty as charged with my Sigma 150-600 lens, but I'm glad I did. It's hard to truly put a value on any product, particularly expensive ones, but my philosophy is, once the basics are taken care of sensibly, then a few luxuries are ok to have. As for value, you can't put a price on a smile. Karen, it would interesting to see what you eventually bought. Just to spur you on..I took these whilst the old girl and I took our Sunday afternoon constitutional around some local footpaths. I'm hopeless at using the rear screen. Far rather prefer a view finder; which is the opposite to the memsahib and youngest, who are used to using these new fangled smart phone thingies. Who went...Oh no! Humans, and he's taking a photo of me!!! I therefore concentrated on three Roe deer, way across the paddock some 100 yards in the distance. Thankfully the setting sun was still high, bright and kind to me. Blast! I couldn't see the fence wire from where I was stood. It appears in all the photos of this deer looking at me. I like carrying the Canon SX700HS around with me for these light walks. Fits into my pocket. Hi Angus/Mike- Wow! What an informative thread this is. Lots to digest. Interesting the comment someone made about camera manufacturers having to up their game to compete with smartphones. My iphone takes amazingly sharp pics - if I can work out how to upload one here, I will! Karen, after almost some thirty plus years of photography, starting out with a basic SLR and separate light meter, I'm still learning today! January will be here before you know it, and you'll be itching for some sensible weather to get out and play with the new camera.